Small form factor graphics cards have become fairly popular for building console-sized PCs with desktop gaming performance. Zotac has released the smallest GTX 1080 TI to date, making it potentially the best performing card you can fit into a really small build. 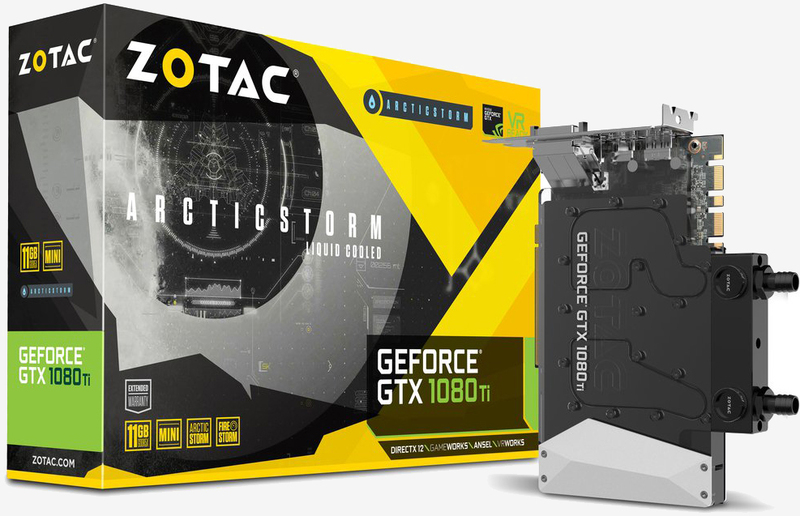 The Zotac GeForce GTX 1080 Ti ArcticStorm Mini measures in at 8.35 inches long and 1.61 inches wide but is still a dual-slot card thanks to the added DVI port and metal backplate. An acrylic top shows off the cooling internals illuminated with white LEDs while micro channels measuring 0.3mm help maximize heat dissipation. Standard G 1/4-inch fittings allow the ArcticStorm Mini to be used with a wide variety of third-party cooling solutions. If needed, barbs for 10mm inner-diameter tubing are also available from Zotac. Similar to most other GTX 1080 Ti variants, the ArcticStorm Mini requires dual 8-pin power connectors. It has three DisplayPort 1.4 ports, a dual-link DVI-D port and an HDMI 2.0b output. A base clock of 1,506MHz can rise up to 1,620MHz, placing it in respectable territory but still well behind full-sized options. For reference, Zotac's own GTX 1080 Ti AMP Extreme boasts a boost clock of 1,759MHz. Pricing and availability is currently unknown but given that this is a specialty form factor with liquid cooling, the price will likely reflect that. See Zotac.com for full specifications and details.